His Grace Augustus Frederick, 3rd Duke of Leinster. 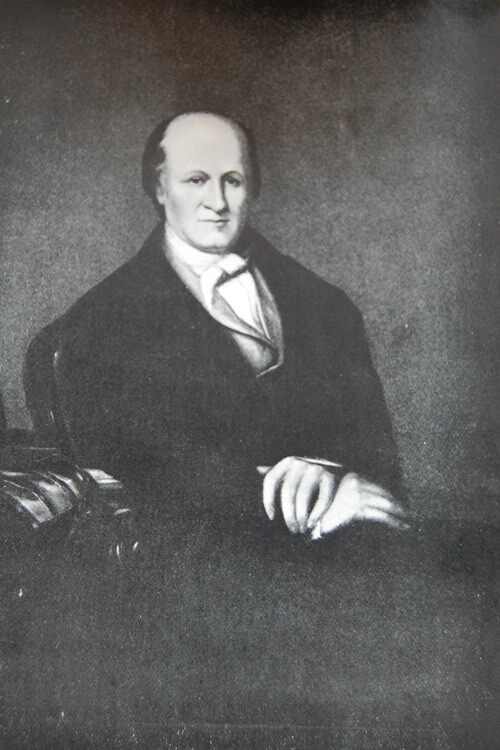 This portrait was originally in the possession of “Lodge of Truth”, No.22. It was brought to the hall in 1870 when the lodge removed from Donegall Place Buildings. There was considerable doubt as to the identity of the subject, but it has been established to be a portrait of Augustus Frederick, 3rd Duke of Leinster, who was Grand Master of Ireland, 1844-1873. It was painted by S. Catterson Smith, P.R.H.A,. a distinguished English artist, who settled in Dublin about the middle of the 19th century, where he executed many important works, including a portrait of Queen Victoria. This picture was authenticated and certified by V.W.Bro. Stevenson Cochran, PG Secretary of Glasgow. The picture of the Duke of Leinster was considered such high value that it was re-produced as a steel engraving by George Sanders. It was by means of this engraving that the picture was identified by comparing our portrait with the two large oil paintings of the Grand Master in Molesworth Street. The similarity was so strikingly apparent that all doubts as to the identity of the portrait were definitely set to rest.